As banks and credit unions around the world retool their branch experience for the digital age, many are pouring more tech into their brick-and-mortar environments. But such digital investments might do little more than simply delay their eventual obsolescence. For those who follow where the future of banking may be headed, there continues to be two distinct schools of thought when it comes to the future of bank and credit union branches. There are the “branch is dead” believers, who feel that all banking transactions will eventually be done digitally, and that the vast majority of brick-and-mortar branches have only limited functionality. Alternatively, there are “disruption deniers” who agree that online and mobile banking use is increasing, but that consumers still want (and use) branches. In reality, both perspectives are correct… to a certain degree. The challenge is being able to determine the pace of disruption, and what must to be done to serve the needs of what consumers really will want as opposed to what they say they want (these are not always the same). There is no denying that the traditional, large-footprint, heavily staffed bank branch is in the process of significant reinvention. More and more consumers use their smartphone for the majority of basic inquiries and transactions, visiting the branch infrequently, if at all. According to a study by UBS, financial institutions now process far more transactions digitally than in branches. And according to McKinsey, since the financial crisis of the late 2000s, more than 10,000 US bank branches have closed – an average of three a day. Despite these transactional trends, consumers continue to show a desire to use branches for some of their banking, such as opening accounts and getting advice or solving a problem. “Smart branches” use digital technologies for several different purposes, including improved efficiency, increased sales, customer education and cutting costs. McKinsey has seen a 60-70% improvement in branch effectiveness — as measured by cost savings and increased sales — from such branches. 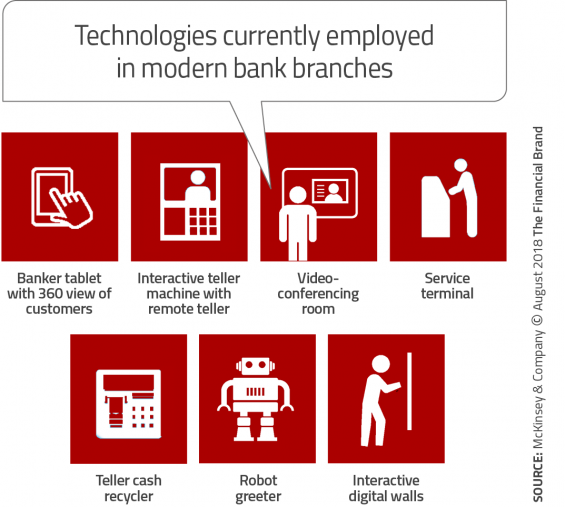 According to McKinsey, the adoption of a ‘smart branch’ option requires more than just the installation and integration of new technology. It requires a complete reformatting of the physical space and the use of personalized, data-driven analytics to improve the overall consumer experience. The secret is in making the experience consistent no matter which channel(s) they choose. “In a traditional bank branch, 70% of the floor space is devoted to tellers and other assisted-sales and -servicing areas, with 30% dedicated to self-service. Smart branches flip this ratio and have a significantly smaller, simpler, and more streamlined footprint,” states McKinsey. In a smart branch, employees greet the consumer and leverage the appropriate technology to provide a solution. No longer do desks and teller stations dominate the floor plan. While the optics of a smart branch may vary based on locational dynamics, the focus is on the migration of transactions and sales to digital channels, 24/7 accessibility, an omnichannel user experience and cost savings. 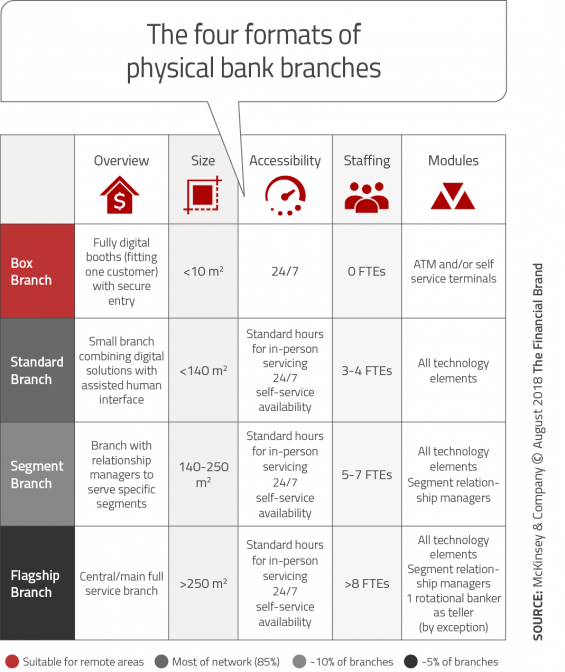 Will Branches Survive the Shift to Digital? As has been stated frequently, becoming a digital organization goes beyond simple redesign or replacing tellers with technology. A digital branch network requires a complete rethinking of digital delivery and how the branch works with other channels. It requires much more than replacing paper. Entire processes must be rethought, with the development of a personalized customer experience at the forefront. According to McKinsey, the goal should be to migrate more than 90% of simple customer activities to assisted or self-service formats, while having 90% of employee time spent on targeted, analytics-driven activities. Technology in the branch will assist both the consumer and the employee, with new data sets available that will reduce misappropriated resources. The financial impact of smart branches will include human cost savings from transaction migration and the real estate cost benefit of smaller branch footprints. At the same time, new analytics and targeted communications will improve sales results. Based on McKinsey research, there could be an overall financial impact of +50% compared to current branch models. The question becomes, will the smart branch still have too much friction for an optimal consumer experience? Many people in the banking industry compare the delivery of financial services to the changes seen in the retail industry. For branch supporters, they mention examples where e-commerce giants are building physical storefronts or how 90% of retail sales are still done in physical stores. Naysayers use the typical examples of Blockbuster or Borders and remind branch supporters that there is no transfer of physical goods to the consumer in banking. In reality, the percentage of in-store sales differs significantly by product segment, from around 98% for grocery and more than 80% for apparel, to very low percentages of in-store sales where products can be delivered digitally, like for music, books, electronics, toys and games. Of greater concern for many financial institutions is that operating margins are already thin and there are significant fixed costs of operating branches of any size. In addition, the profit and differentiation is being attacked by fintech and big tech firms who can deliver services that are cheaper to deliver and more personalized. If the bank brand is not capturing it’s fair share of new customers or existing customers who are increasingly using digital channels, the economics of any format of ‘smart branch’ is questionable. The delivery solution for banking services in the digital age requires a complete upheaval of traditional norms. The industry must move away from the obsolete product-centric model to one that is consumer-centric. This requires the use of data and advanced analytics to focus on the entire consumer journey – personalizing each consumer interaction to add value beyond what is possible from other competitors. Beyond simply improving digital account opening, implementing a more robust onboarding process or changing communication, there needs to be innovation that can quickly turn consumer insights into action. This includes creating new products for consumers, new forms of engagement, or proactively using real-time insights to deliver what consumers want based on their behaviors. There are three reasons why physical branches continue to be held in reverence within the industry. 1. Organizational norms: To tear down internal silos and to close branches requires the dismantling of organizational structures, processes, technologies and incentive structures that have been in place for decades. 2. Lack of insight-driven culture: Without turning consumer data into insights, and creating a single version of the ‘truth’, organizations rely on consumer myths that have permeated organizations for decades. The result is incremental changes that cut some costs or increase revenue using a modified version of what exists today as opposed to a completely new model. 3. Fractured technology: While some organizations have invested in new back-office technologies, many system upgrades don’t work well with each other, reducing the ability to connect important data points. Instead of modifying the delivery networks already in place (usually without closing many brick-and-mortar facilities), banks and credit unions must transform themselves from product-centric to consumer-centric, using data and insights to drive decision making. Rather than looking at reducing costs or increasing revenue in a branch-centric model, they must create better digital experiences. Revenue in the digital age will be generated by the value delivered as data is transformed to insights and then to action on behalf of the consumer. Those who are fastest to proactively deliver solutions based on consumer behavior will win. This means that banks and credit unions need to stop protecting existing organization structures, delivery networks, processes, and infrastructure investments. Once all of the processes are optimized for digital delivery, consumer insight should then be leveraged to determine the number, size and location of physical branches. Not the other way around. While the result will not be the ‘death of branches’, the need for branches in the future will be significantly less than today. This article was originally published on August 13, 2018 . All content © 2019 by The Financial Brand and may not be reproduced by any means without permission.